Obstructive Sleep Apnea (OSA) is marked by obstruction of the upper airway during sleep. This causes pauses or breaks in breathing, preventing air from entering the lungs and forcing the person to wake briefly to start breathing again before falling back to sleep. A person with OSA is usually unaware of this. The interruption to breathing can happen hundreds of times a night, resulting in markedly fragmented sleep. As a result, people with OSA feel excessively sleepy during the day. Individuals with excessive sleepiness suffer from drowsiness, reduced concentration and an overwhelming desire to sleep when they need to be awake. This leads to changes in mood and personality and a general reduction in quality of life. Approximately 2 percent to 4 percent of people suffer from OSA in the U.S. That’s about 18 million people, giving the condition a similar prevalence to Type 1 diabetes and double that of severe asthma. Being overweight is one of several major risk factors for OSA, in particular, fatty tissue within the neck, which can compress the upper airway. 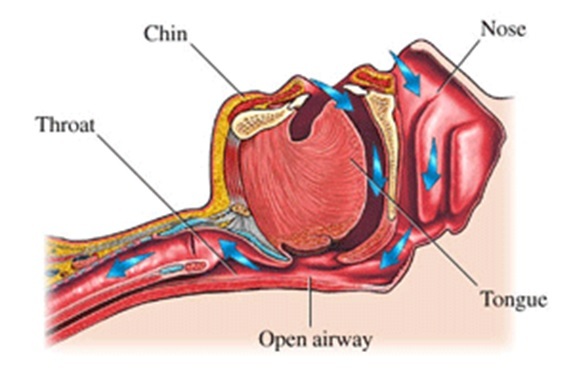 During sleep apnea, air flow is completely blocked.